Aquatherm’s corrosion-resistant qualities and 10-year warranty gave the owners peace of mind. "Copper is more expensive, harder to work with, and it doesn’t have a good R-value. Since PVC becomes really brittle when it gets cold, that was not a viable option for us either. We picked Aquatherm because of the price, R-1 insulating value per inch of material, and the ease of installation." Using Aquatherm instead of copper saved about $12,000 on upfront costs. 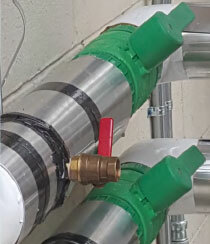 Aquatherm’s R-1 value per inch ensured the piping wouldn’t crack or break when used for the glycol system. Aquatherm, with its heat-fusion technique, was easy even for the owners to install themselves. A startup brewery needed to save as much money as possible, and find a piping system that wouldn’t crack under extremely cold temperatures. Nashville: Music City USA. Besides being the birthplace of country music, Nashville, TN, is known for great restaurants, an art scene and a vibrant night life. It’s no surprise Adler Lentz and Kurt Smith, business partners and owners of Smith & Lentz Brewing Company, decided to open their brewery in the vibrant and dynamic city. The brewery includes a taproom featuring 22 beers that is open to the public. Additionally, Smith & Lentz has five distribution accounts in the Nashville area. Smith’s love of craft beer developed early: While Smith was attending the University of Minnesota, Minneapolis, from 2005-2009, he noticed that the area’s brewers were not only creating interesting and unique beers, they also were building and sustaining a sense of community around its brewery culture. He also had the opportunity to travel abroad during college, and thanks to a semester in Prague, he further developed his love for and interest in craft beers, which translated into a serious hobby. After college he moved to Austin, TX, and while living there he brewed beer at home, learning the ins and outs of various brewing methods. Also in Austin, he worked as an environmental and risk consultant and found time to volunteer at local breweries. Meanwhile, Lentz was working as an apprentice at a small brewpub in Milwaukee, WI, learning the basics of commercial brewing. After his apprenticeship, he moved to San Diego, CA, and became a brewing-equipment installer. For four years, Lentz built systems for a variety of breweries—from startup breweries to larger commercial ventures. 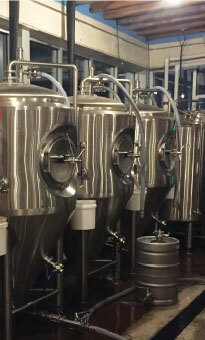 One of the brewery systems Lentz installed happened to be in Austin. When Smith and Lentz met, it was clear that Lentz’s extensive craft-brewing experience complemented Smith’s business acumen. The two craft-beer aficionados started talking about building a brewery, taking only four months to create a solid business plan. Once their business plan was completed, they moved from Austin to Nashville to start work on the brewery. They hit a temporary snag when a fire broke out in the brewery building, but it didn’t sidetrack them for too long: The entire project—from creating a business plan to opening the brewery to the public—took three years. Designing a glycol-cooling piping system for the brewing process, including research, product certification, and installation, took only two months; the brewery then opened in the fall of 2015. Smith and Lentz researched a variety of materials, including copper, Schedule 80 PVC, and ABS, to use for the glycol-cooling piping system. Eventually, they came across Ferguson Enterprises, a wholesale distributor of plumbing and mechanical supplies with 1,400 locations serving customers throughout the US, Puerto Rico, the Caribbean, and Mexico. According to Lentz, he and his partner were considering copper, but its expense wasn’t feasible for their project. Hollis as well as Mike Nix and Pete Trautman, local Aquatherm reps with manufacturers’ representative firm Mike Nix & Associates, Peachtree City, GA, mentioned Aquatherm as an option for the brewery system. Lentz also was interested in Aquatherm because he had seen it two years earlier while in Florence, AL, at the Singin’ River Brewery. The brewery had used Aquatherm for its glycol-cooling system as well. Heat fusion is a process used to join thermoplastics such as PP-R together. Similar to welding, heat fusion physically turns the two pieces of plastic into one piece. In the case of Aquatherm’s specially formulated Fusiolen PP-R, heat fusion does not weaken the material at the point of connection. The heat-fusion connections have the same strength as the pipe wall, so the connections are as strong as the pipe itself. Heat fusion returns the connection point to a melted state, the same state it was during production. This creates a permanent bond: The polypropylene chains join together as the connection cools, preventing any sort of chemical or physical weakness at the joint. This results in a much lower instance of leaks or failures. Smith and Lentz were trained by Trautman and Hollis, and they now both carry the Aquatherm Factory Authorization Card for Installers. The Aquatherm Installer Training Program is designed to help plumbers, contractors, and installers become proficient in heat-fusion techniques, as heat fusion offers many advantages, such as speed and consistency, when installing a pipe system. Training is done in a classroom setting with practical hands-on experience, preparing installers for the work they will need to do in the field. Once the training was completed, Smith and Lentz were able to begin the install as soon as the product arrived on-site, which didn’t take long because Ferguson is the sole source of Aquatherm pipe in Tennessee. Also from Ferguson, Smith and Lentz rented a bench machine and McElroy Spider™ 125, designed for quick and accurate socket-fusion field installations of 2- to 4-in. PP-R pipe and fittings. Aquatherm’s benefits include labor savings; a 10-year, multimillion-dollar warranty; and environmental friendliness: No toxins or VOCs are associated with installing the PP-R piping systems. Aquatherm requires much less energy to produce than metal piping systems, and they are completely recyclable when no longer needed. Additionally, Aquatherm is less likely than other types of systems to be stolen from a jobsite. Further, Aquatherm piping systems are made from PP-R, one of the longest lasting and most chemically inert piping materials available. Hydrophobic, Aquatherm PP-R does not react with water. It won’t corrode, scale, or pit like metal pipes, and it can withstand extreme temperatures up to 180°F at 100 psi. To construct the glycol-cooling piping system, Smith and Lentz chose 2-in. Aquatherm Blue Pipe® for all of the headers—the actual loop that runs to and from a PRO Refrigeration glycol chiller with a 100-gal. reservoir, which is common in breweries—amounting to 350 ft of Aquatherm pipe. 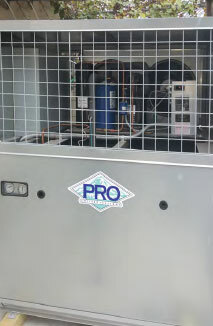 The self-contained glycol chiller continuously circulates 160 gal. of glycol through a closed loop. The chiller has two pumps: one pump manages the temperature by circulating the glycol through the chiller to maintain a setpoint of 29°F; the second pump constantly circulates glycol through the closed-loop system, which delivers cold glycol to any of the brewery’s eight vessels, such as the fermentation tanks and packaging tanks, as needed. Electronic temperature sensors on the brewery’s eight vessels control a solenoid valve on the glycol supply piping system. When the sensors notify the associated computer system that a tank needs cooling, the solenoid valve opens, allowing the cold glycol to flow through the warmed tank and chilling the brewery products inside. Once the vessel reaches the correct temperature, the solenoid valve closes, and the glycol is cut off from the vessel. Each of the vessels is in a various stage of fermentation or conditioning; because there are many different stages, the demand for cooling is constant, so the chiller continually works to maintain the 29°F glycol setpoint. To ensure the glycol routes correctly, the supply piping system operates with about 16 lb of pressure, while the return piping system uses close to 0 lb of pressure. When a vessel requires cooling, the glycol takes the path of least resistance. It flows down from the supply piping system around the vessel, then back up through the no-pressure return piping system to complete the loop. Even if no vessel calls for cooling, glycol continuously flows through the closed loop, ready to maintain any vessel’s temperature. “Glycol-chilling systems for craft breweries continue to be a good application,” Trautman said. 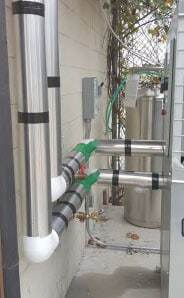 “[Lentz] told another brewery owner about Aquatherm, and we now have another installation underway.” Yet, Aquatherm has so many uses in a brewing operation: It is approved for potable water and food contact and is great for compressed air, heating and cooling and so many other applications. “Overall, Ferguson was great to work with, the insulation value of the Aquatherm pipe is great, and we don’t have drips anywhere [resulting from condensation]—when I walk into the brewery every morning, it is bone dry,” Lentz said. Eliminating toxic materials, glues and resins, and open flames from the piping installation equation. An R-value of 1 or more per inch or greater depending on pipe size and SDR. The fusion welding process, which creates seamless connections that last a lifetime without leaking or failing. An optional faser-composite layer in the pipe reduces linear expansion of the pipe by up to 75% compared to plastic piping.